The unique Japanese cartoon style known as manga, with its exaggerated stylistic characters and vivid colors, has caught the attention of America. Now, with the advent of digital tools like Photoshop and Painter, manga artists have discovered new ways of bringing their artwork to life and onto the computer -- with astounding results! 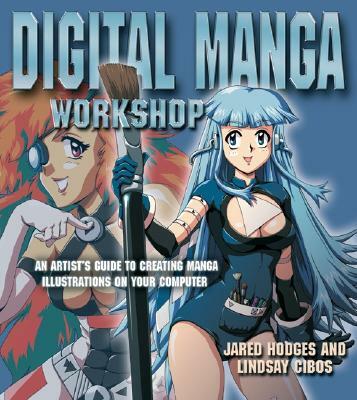 This complete guide presents a wealth of information by exploring the digital possibilities of creating manga-style artwork. It details the entire process, from initial rough sketches, to the finished color image, with in-depth instructions and illustrations that demonstrate the intricacies of each technique. It also deals with a variety of inking and coloring styles.revealing the secrets of how to achieve smooth, highly detailed line art directly on screen, how to recreate the appearance of traditional animation with cel-art techniques, and how to achieve a soft, dreamy, or traditional look with airbrush, watercolor, and painting tools. It also explains how custom backgrounds, special effects, and the use of filters can add the finishing touches that exemplify professional results. Jared Hodges and Lindsay Cibos are the creators of the ongoing graphic novel series Peach Fuzz, for which Lindsay Cibos won the Grand Prize in the prestigious Tokyopop Rising Stars of Manga contest. They have created manga-style artwork on computers since 1997, when they first discovered the power of digital tools like Photoshop and Painter. Since then, they have worked with over a hundred different clients on various print and online projects, including the anime-inspired roleplaying game book Big Eyes, Small Mouth: d20 Edition.